In a bowl, mix together the ricotta, mozzarella, pesto and the egg (the egg keeps the filling from getting too runny when cooked). Roughly chop the spinach and stir it into the cheese mixture. Refrigerate the filling until you are ready to use it. Cook the pasta according to the directions on the box (boil for 12 min.). I added 1 Tbsp of cooking oil to the boiling water to keep the shells from sticking to each and the pot. You will still need to gently stir a few times during cooking. Be careful not to over cook the pasta or else it will rip easily and be too mushy after cooking with the filling and sauce. Drain the pasta and rinse with cool water to stop the cooking process. Let the pasta drain. Preheat the oven to 350 degrees. 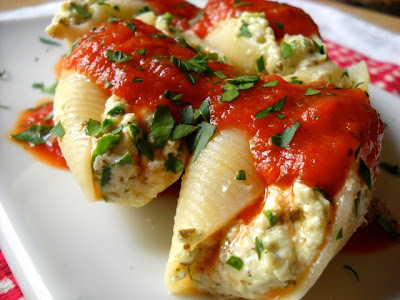 The shells roll up tight (see photo below) when they are cooked so use the fingers on one hand to hold them open as you spoon about 3 Tbsp of pesto cheese mix into the center of each. There should be enough pesto cheese mix to fill the shell so that it stays open just slightly (the edges should be about 1/2 inch apart). Fill as many shells as you can with the cheese mix. Spread one cup of pasta sauce in the bottom of a glass baking dish. I used a 9.5x14 inch dish because that was all that I had available at the time but it was too big for 22 shells. You want to pack them in tightly in a single layer. If you space them too far apart, they will dry out during the cooking process. Place all of the shells in the baking dish as close together as possible and pour the remaining 2 cups of sauce over top. Bake for about 30 minutes at 350 degrees or until the sauce is bubbling up around the edges.